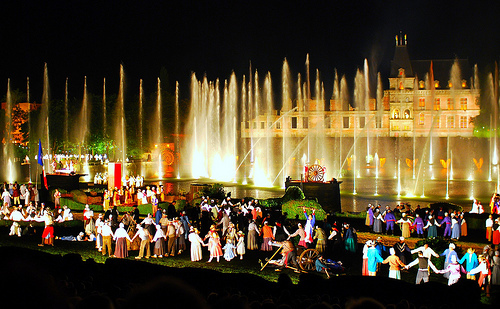 Puy Du Fou. 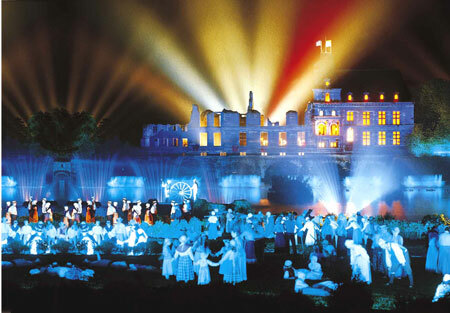 The "Cinescenie"
The Concept: The Association of the Puy du Fou was founded in November 1977 as a non profit making society. Originally they had 2,600 members drawn from the 15 villages that surround the Puy du Fou. The "Cinescenie" was first produced in the summer of 1978, the producer of the show was Philippe de Villiers who went on to become the "Conseil General" of the Vendée,in 2007 he was nominated by the “Mouvement pour la France” as a candidate in the election for president of France and it was under his guidance that the show has become the world renowned spectacular that it is today. The Cinescenie. Experience the awesome excitement of the biggest night show in the world, where 1,200 actors using 6,000 costumes with 70 horsemen and all of the latest technology entertain you for 1 hour and 40 minutes with a show that is as awesome as it is breathtaking. It is a true "Son et lumière" a medieval pageant play displayed with 21st century technology. The show tells the history of the Vendée as seen through the eyes of a small boy over the period from just before the start of the Wars of the Vendée in 1793 through two centuries to the present day. Nothing about this show is on a small scale, the Stage covers over 70 acres and is the largest stage in the world, the water fountains and firework display are the largest of their kind held on a regular basis in Europe, the list goes on and on, but to really understand the enormity and magic of this spectacular you will need to visit and see for yourself. Due to the popularity of the show you will need to pre-book especially for the main holiday season which is normally sold out months in advance. September. 1st & weekends 7th- 8th & 14th - 15th.